I keep hoping everyday that my maid would have cooked something delicious for dinner. She(Maid): Aapne call nahi kiya na, isliye maine socha aap kuch banayenge, maine tho sirf aata ghunke rakha hai. (You didnot call me, so.., I thought you would be cooking. I just prepared the dough for rotis). Me: (Grrrrrrr...trying to smile again)Ok, let me have a quick look at the freezer. Prepare a fine paste of tomato, onion, ginger-garlic paste, green chillies & cilantro. Heat a broad pan. Add 2 tbsp of oil to it. When oil is hot, add cumin seeds. When cumin seeds splutter, add the paste prepared in the previous step. Reduce the heat & cook it on a slow flame. Meantime, in a wok, add 1 tsp of oil & saute the broccoli until tender & yet crunchy (it takes around 5-6minutes). 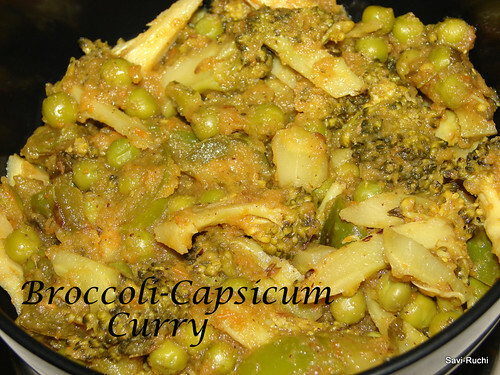 Set aside the broccoli & repeat the same with capsicum. Mix the vegetables & keep them aside. Ensure the raw smell of onion & tomatoes vanish away. The gravy starts oozing out oil. At this stage, add 1/2 cup of water, green peas, salt, red chilli powder, amchur powder, kasuri methi & mix well. Add the vegetables to the gravy & cook on a medium flame for another 5-7minutes. Add garam masala & remove the gravy from heat. Serve it hot with rotis. Note* : I have not seen this served on the banana leaf on any wedding/upanayanam. So, I am not very sure on this. Apart from the above, there are few more attractions like fruit salad (hannina rasayana) served just before curd rice, majjige huli (buttermilk sambar), another type of koddel/sambar (gujje koddel) & latest addition icecream (so nice of them) left out in the above picture. Shivalli Madhwa Brahmin wedding/festive food is royal food and the best (sometimes worst!!) part is.., they don't repeat the same dish. You will have 30+ types of dishes to try out. It is a delight to our taste buds & also a visual treat. 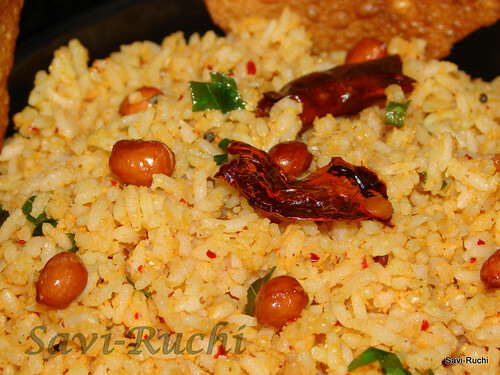 Coming to Coconut mustard rice, I love eating this rice. But, as mentioned before, they don't serve this rice for second time(refer to 9th item). And the quantity served is at best, 2 tbsp on the left side of the leaf. I always crave for it again & again throughout my meal. In order to overcome my craving, I prepare this dish, the very next day at home & relish it again. This dish is also served as prasadam at few temples. Believe me, this simple rice is finger licking good. Cook the rice with double the amount of water & allow it to cool. Don't make the rice soggy. Grains need to be separate. Left over rice makes this dish double tasty. Squeeze the tamarind juice & keep aside. Heat a wok, add tamarind juice, jaggery, salt & allow it to boil for 5-7minutes. Keep stirring in between. The tamarind water should become thick. Add the coconut paste to it. Cook on a low heat for a minute. Turn off the flame. Allow it to cool. Coconut-mustard gojju/gravy is ready. Prepare the tempering. In a pan, heat oil. When oil is hot, add mustard seeds followed by urad & channa dal. When dal turns golden brown, add ground nuts. Fry till nuts turn golden brown. Add broken red chilli & curry leaves. Saute for 10 secs. Add turmeric, asafoetida & pour this tempering to the rice. Also, add the coconut mustard gojju/gravy prepared to rice. Mix them well. Add salt if required (salt has already gone into the gravy/gojju). Do not add cilantro (coriander leaves) as it changes the flavor of the rice. Add curry leaves as much as you want. Adjust jaggery according to your family needs. The coconut-mustard gojju can be mixed with the cooked rice noodles to make kayi-saasive shavige (coconut-mustard noodles). 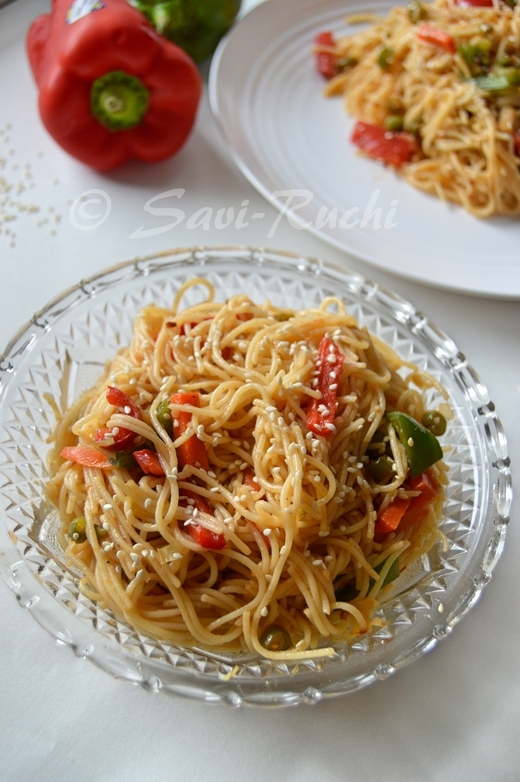 I posted my first recipe on 18th Aug 2008 with zero knowledge on blogging. Surprisingly, I never visited any foodblog before that. Slowly started finding some great foodblogs around & also made alot of friends. I have the same zeal as I had one year before (touch wood) & want to post hundreds of more recipes. Also, what more can I expect than these wonderful awards that made their way to celebrate my blog anniversary. Thanks a lot Lakshmi, Suparna & Jayasri. They are indeed the precious gifts, my blog received for its first birthday. 1. Me..., a chatterbox. I can talk to strangers as if I knew them for many years. However, my friends circle is very limited. I open my heart to only very few. 2. I like collecting designer & silk sarees, but often postpone wearing them. 3. I love experimenting in my kitchen. However, my blog hopping is limited to few tried & tested ones. I do try a lot of recipes, but often fail to note down the ingredients immediately. After 15 days, I forget what went into that recipe & the photo goes to my thrash. 4. I absolutely love yogurt in any form. 5. I love planning for any occasion. Be it wedding, upanayanam or naming ceremony. I plan & select my accessories to match in with my saree. I can plan as early as 6-10months before the occasion. 6. I hate rats. I get all kinds of rats in my dream, even if I happen to see them once. 7. I dont like any kind of soft drinks or fresh fruit juices. I forcefully sip fruit juices & milkshakes. I prefer home made buttermilk, ragi ambli, lime soda (with salt). Few t-shirts for my son. Lakshmi is always there for me from my initial blogging days. I have learnt a lot about blogging, html editing & widgets from her. I love her North Karnataka recipes. I love Suparna's warm comments. She has great recipes at her space. 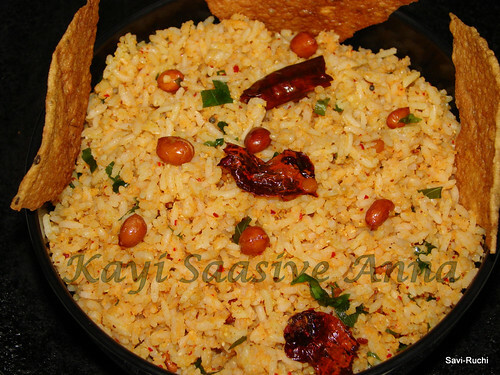 I knew Jayasri recently & she has some new recipes at her blog that I am waiting to try. Can I get 2 houses? One in Mysore & the other in Chikmagalur/Agumbe? "People buy things that they dont need to impress people whom they dont like". All of my family members. All my silk & designer sarees. I love TINKLE, balamitra, champaka, Amar Chitra Katha & all other children's story books. Jeans or skirt with a big bindi & loads of gold jewellary. I love to be simple most of the times with a comfy t-shirt & a capri or jeans. Rangeela, A Wednesday, Socha Na Tha, Nammura Manadara Hoove, HAKHK & many more. Lacto-calamine, lipbalm & body lotion. Light music, long chat with a friend & good food. Be simple & natural. Dont try to imitate people & choose outfits that you are not comfortable wearing. I love coffee & can have any number of times. Beautiful women. It also means first ray of light in Sanskrit. Most of the blogs I visit are wonderful. Jamun, hayagreeva, halubayi, paradi payasa & many more.. I shall cook doodh peda, bisibelebhath, curd rice & some jackfruit papad. Here is my new question. Thanks a lot for the lovely awards. Awards has been placed at my sidebar. Just note down the ingredients & cook it when you are missing home & do not want to cook elaborate meals. Boil the milk on a medium heat. When milk starts boiling, turn off the flame. Add turmeric, salt & lemon juice. Stir well. The milk starts curdling. It might take upto 15minutes to curdle. If you feel, the curdling is not uniform, feel free to add some more drops of lemon juice. Meantime, heat oil in a wok. When oil is hot, add cumin seeds. When cumin seeds splutter, add onion & green chillies. Saute until onions are translucent. Add capsicum & saute again on a medium heat for 4-6 minutes until capsicum is soft & yet crisp. Add little salt(you added salt already.., be cautious..), scrambled paneer(Indian cottage cheese) & mix them well. Cook it on a low heat for 2-3minutes. 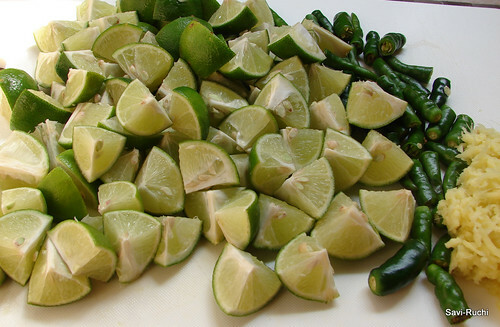 Add lemon juice & mix them well. Garnish with cilantro & serve it warm or hot. Store bought paneer could be used to prepare this dish, but I feel home made, fresh paneer tastes great. Hard paneer (cubes or block) would be tougher to handle as this dish calls for scrambling the paneer. 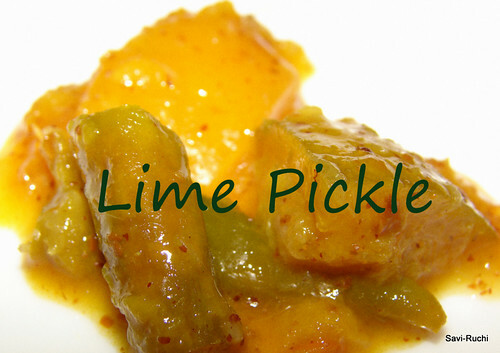 One can make this dish more spicy by adding paprika, garam masala or any other spice powder of your choice.